Invasion of Chaos is a Booster Pack, which combines the Japanese sets Controller of Chaos and Invader of Darkness. In the Yu-Gi-Oh! Trading Card Game (TCG), it was released in English, French, German and Italian. In the Yu-Gi-Oh! Official Card Game (OCG), it was released in Asian-English and Korean. Invasion of Chaos has two English prints, a North American print with set numbers IOC-### and a worldwide print with set numbers IOC-EN###. As well as being sold in singles, it was included with Invasion of Chaos: Special Edition and Force of the Breaker: Special Edition. The French, German and Italian prints were first available through Force of the Breaker: Special Edition. The worldwide English print was included in Master Collection Volume 2 and Force of the Breaker: Special Edition. In 2010, an Unlimited Edition print of the North American English print was reprinted and released with Legendary Collection. The cards in Invasion of Chaos and Ancient Sanctuary were reprinted in the OCG set Expert Edition Volume.2 and its TCG version, Dark Revelation Volume 2. Invasion of Chaos contains a variety of powerful cards for many different Types, including Dinosaur, Insect, Sea Serpent, and Beast. It contains the powerful "Chaos" monsters, "Black Luster Soldier - Envoy of the Beginning", "Chaos Emperor Dragon - Envoy of the End" and "Dark Magician of Chaos"; cards which further promoted the use of the already powerful LIGHT and DARK Attributes. It also contains support for a style of play revolving around banishing cards. Highly sought after cards include the aforementioned "Chaos" monsters, "Levia-Dragon - Daedalus", "Strike Ninja", "Smashing Ground", "Manticore of Darkness" and "Dimension Fusion". 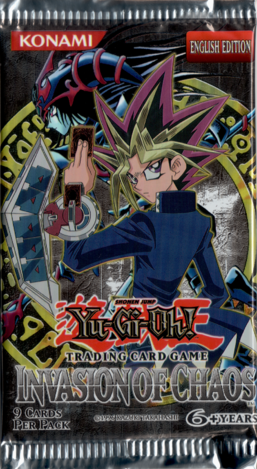 Yami Yugi's appearance on the cover of this booster pack is taken from the omake on the last page of Yu-Gi-Oh! Duelist Duel 149. This was also used earlier for Booster Chronicle and Duelist Legacy Volume.5, and later for Retro Pack 2. In the TCG and Asian-English versions of this set, each pack contained 9 cards and each box contained 24 packs. In the Korean version, each pack contained 5 cards.